Since 1983 Bruce has been leading groups to Assisi, Italy the home of St. Francis and St. Clare. Discovering this small hill top town in the heart of Italy, full of simple peace, he was inspired to share the steps of heartfulness as shown by Francis and Clare. Since 1993 Ruth and Bruce together have been sharing the joy of St. Francis with many. Their Assisi journeys were filled by grateful readers of Bruce's books on St. Francis and personal growth and by word of mouth of participants in their retreats in many parts of Europe and America. In these retreats participants felt the spirit and great heart of St. Francis and were moved to make the pilgrimage to Assisi. Assisi is the spiritual home for many in all traditions in its offering of the gifts of simple peace, nature, and service to others. In 1999 Bruce and Ruth were inspired to sell all their belongings, leave their home in California and move to Assisi. The adventure brought many treasures including the Temple for World Religions and the Hermitage of Simple Peace. Their mission was to create a place for the silence of the heart, where everything is present and an unspeakable love prevails. In 1999 Ruth & Bruce restored the original Courthouse of Assisi, that existed in the time of St Francis and St Clare into a Peace Center for the World Religions, turning a room that once was a place of judgement into a place of non-judgement. It was sold in 2009 when they finished reconstruction of their retreat home in the countryside just outside the town of Assisi.. There were altars for Christianity, Judaism, the Muslim Faith, Buddhism, Nature Religions and Hinduism. People of all traditions were welcome. Whirling dervishes, Hari Krishnas, Catholic Priests, Buddhist Rinpoches and Shamans & Priestesses all contributed their blessings and worship in the temple. Pope John Paul gave a special blessing to the Peace Center in Assisi in 2001. In January 2002, Pope John Paul II planned a meeting of the leaders of the world religions in Assisi, Italy. After being invited to visit the Assisi Retreat Center, the Vatican responded with a letter. "From the Secretary of the Vatican to the Bishop of Assisi in the name of Pope John Paul II for the Assisi East West Retreat Center. Mr Bruce and Mrs Ruth Davis are responsible for the Assisi Retreat Center. 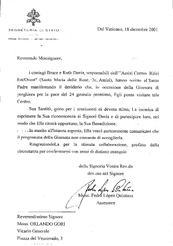 They have written His Holiness to request the possibility that he visit them during his time in Assisi on January 24th, 2002. His Holiness is very grateful for their genuine sentiments expressed from their devout voices. Please express his gratitude to them by giving them his blessing. Unfortunately when His Holiness is in Assisi he will not be able to visit personally. However, please make the most of this moment and offer them his most respected blessing. Thank you for your cooperation." In 2002 the Davis' created this beautiful Hermitage of Simple Peace. Awarded one of the top ten Retreat Centers in the world, by Travel & Leisure Magazine, in 2008 and again by CNN in 2011. We sold the Hermitage in 2016 and have come back to leading the retreats from the center of the old town.